Four weeks from today — September 25, 2018 — New Albany voters will decide whether to approve up to $8.5-million in bonds to pay for work on school buildings. State law requires a 60% affirmative vote for the school bond issue to be authorized. The New Albany school board approved the bond issue proposal and set the September 25 election date during its August 6 meeting. 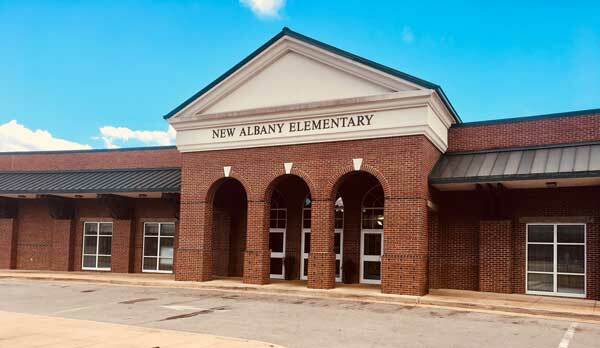 The school board had retained the Tennessee-based firm, A2H Architects & Engineers, to survey the condition and maintenance needs of the New Albany Public School District’s buildings. That assessment started early in 2018. A2H told the school board it found repair and maintenance needs in seven of the school district’s buildings that would require $8.9-million in funding. A2H identified about $6.5-million in what were called “poor and critical” needs. The other $2.4 million is for what are considered less critical, long-term needs. School board members were reportedly taken aback by the amounts said to be needed, with particular concern about the $1.7-million needed for work at the elementary school, which was completed just 16 years ago. Board members were told that much of the mechanical equipment at the elementary school has already exceeded its anticipated life span. New Albany Elementary School, the newest of the school district’s buildings. At its August 6th meeting. the school board essentially decided to do most of the repairs and improvements during 2019, with work starting when the school year ends in May. The board is asking the school district voters to approve the sale of up to $8.5-million in interest-bearing revenue bonds to pay for the work. New Albany Superintendent of Education, Lance Evans, has said the actual amount needed may be higher or lower, depending on conditions revealed as the work proceeds. School officials have provided a substantial amount of detailed information about how, where and why the money will be spent. (Links below). School officials say principal and interest payments on the $8.5-million in bonds can be made without an increase in property taxes. They explain that voters approved a $9.85-million bond issue in 2001, which money was used to build the new elementary school and make improvements at the middle school and high school. An 11-mill tax levy was imposed to pay off the 2001 bonds, which had a term of 20 years. The 2001 bonds were subsequently re-issued at lower interests rates and the payments accelerated, so it is expected they will be paid off early. Superintendent Evans has said that the 2001 bonds will “roll off” — be paid off — next year, so revenue from that the 11-mill levy can be used to pay off the new bonds, which the school board wants the voters to approve in the September 25th election. The revenue from the 11-mill levy can only be used for debt service and cannot be applied to operational expenses of the school district. Lance Evans, superintendent of the New Albany public school system at August City Board meeting. Thus, property taxes would be expected to decline after 2019, unless the voters approve issuing the new bonds at the September election. 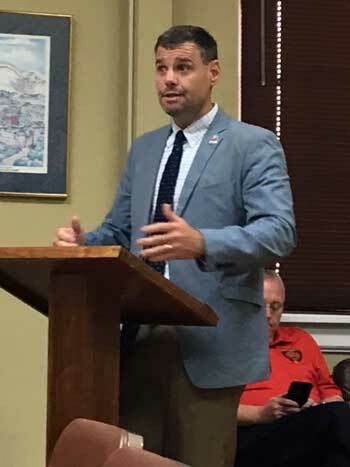 Evans appeared before the New Albany Board of Aldermen at its Tuesday, August 7, meeting, the day after the school board approved the bond issue and set the election. First Ward Alderwoman, Amy Livingston, asked Evans if continuing the 11-mill levy from 2001 did not, in fact, constitute a tax increase, since it would no longer be collected if there is no debt service on bonds after 2019. Asked why the bond election was scheduled on relatively short notice, just 52 days after the school board’s decision, Evans said the election had to be held then, so there would be time to generate exact specifications, advertise for bids, award contracts and be ready to start work immediately after school is out in May. The A2H Engineering and Architectural firm would oversee the work to be done with the money raised by a new bond issue. Although A2H did not charge the school system for the evaluation that resulted in its recommendation, the firm would receive fees, which would be added to the cost of the work. For roofing projects, A2H would be paid fees of 4.5% of the cost of the project. For new construction A2H would be paid 5.5% over and above the actual construction cost. For what is called “remediation remodeling,” A2H would receive added fees of 7% of the cost of such work. Last Thursday, August 23, at 6 p.m., Superintendent Evans presided at a meeting held in the media center of New Albany High School, at which about 60 individuals were present. Among those present were several New Albany aldermen and Union County supervisors, at least two physicians, several business owners, several bankers, and, most numerously, active and retired educators. Evans said, “I called each one of you personally” and that all were there by invitation. “We wanted to get the right people here,” he said. A two-page document titled “frequently asked questions” was distributed to each person in the room. (See link below).